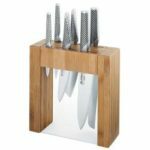 When it comes to buying kitchen knives, there seems to be a lot of confusion regarding the price and high quality. As such, all knives look (and are indeed) sharp when you buy them new. All blades can be sharpened; the difference between them is the time they take to dull – the sharpness of some last much longer, while some others dull very fast. And it’s this time that expensive kitchen knives offer – their sharpness lasting longer. Sharpness of a knife depends on how well the blade was made initially and how it is sharpened on a whetstone. However, the ability of a knife to cut well depends mostly on the metal with which the blade is made, the angle of the bevel and how you use (or abuse) the blade. Whether it is cheap or expensive kitchen knives, what matters for us is its sharpness. We’ll always prefer a sharp knife no matter how expensive it is. Expensive knives remain sharp longer and you feel better while holding them because of the balance they offer. However, keeping up sharpening the knives is also important. Most chefs (professional or home) require two to three knives for all the jobs done in the kitchen. Primary Knife: A chef’s (European style) or gyutou (Japanese style) knife is your primary knife with which you will do most of your jobs, like chopping, smashing, peeling, dicing and even slicing. If you decided to have only one knife, this is the one you should have. Secondary Knife: A paring knife is your secondary knife. This is for getting into difficult-to-reach corners and quickening the work of fine cutting or scraping. Slicing Knife: A slicing (European style), or a yanagi or a sujihiki (Japanese style) knife is used for filleting fish or carving meat. Its blade is thin and is designed to slip easily past both cooked and raw seafood and meat, almost without any effort. Because of its length, it gives a long continuous clean cut is easy. Serrated Knife: If you want a fourth knife, you can have a serrated knife; you can also do fine without it. First important factor to consider is comfort. E.g. for larger hands, a bigger handle is comfortable. Second factor is to see how well balanced the knife is. If it offers really good balance, you will feel it after a long time working – how much less fatigued you feel. The metal with which the blade is made is the last factor to consider. High carbon steel offers a very sharp edge, but it’s very brittle. Stainless steel is durable but doesn’t offer a very sharp edge. To get comprehensive reviews of kitchen knives, visit CookLoveEat.com. This will enable you to take an informed decision while choosing kitchen knives.